The Free Standing Trapeze with Base and Wheels, from Drive, helps people move with greater care during in-and-out of bed transfers and also with in-bed adjustments. The trapeze is built to sustain pressure and offer support. 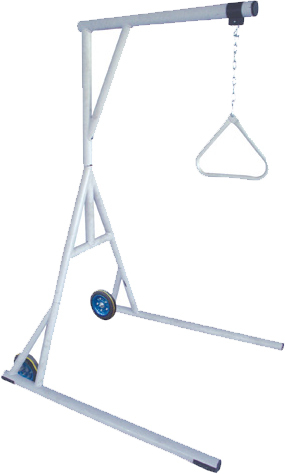 This free standing trapeze is able to uphold 1000 pounds. Easy to assemble Tool-free design. 6. Slide boom (5) over mid post (4) while holding lock pin. 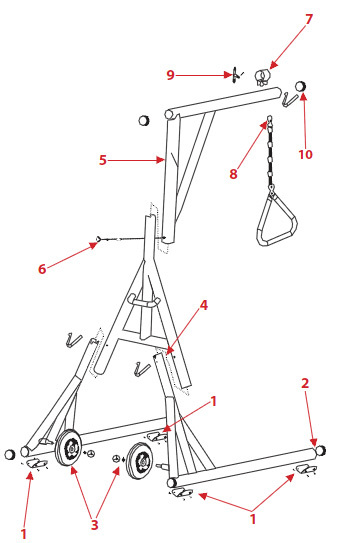 (6) Once attached rotate boom until straight. (Lock pin until clicks into position). 8. While holding top of chain/trapeze (8) inside collar, slide trapeze lock (9) though collar and “S” hook on chain. Turn trapeze lock until tight. 9. Insert boom cap onto boom.